In this article, we’ll be reviewing my top 10 online payment systems for accepting payments on the Web. While many of the companies on this list have been available to online merchants for years, many are also now getting into new areas of online payments such as social commerce and in-store online card reader systems. Before getting started, here are just a few things to know about online payment systems. 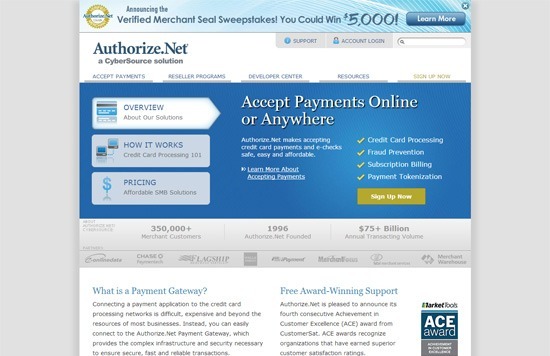 Authorize.Net is the Internet’s most widely used payment gateway. With a user base of over 300,000 merchants, Authorize.Net has been the go-to method for e-commerce sites that need a gateway to accepting payments. Widely used e-commerce platforms such as Magento, Volusion and X-Cart are designed to accept payments using Authorize.Net easier. 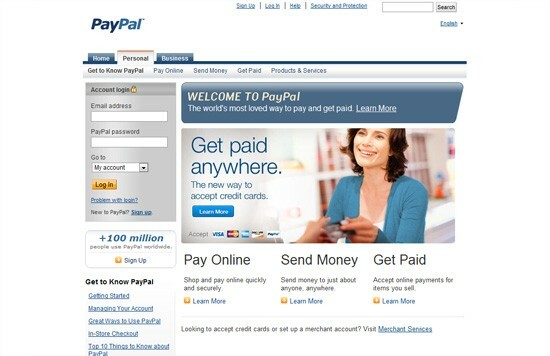 PayPal is the world’s most widely used payment acquirer, processing over $4 billion in payments in 2011. PayPal payments are made using a user’s existing account or with a credit card. Money can be sent directly to an email address, thus prompting the users to sign up for a new PayPal account. In addition to taking payments, PayPal also allows its users to send money through the service, which is a feature that only a few payment solutions provide. 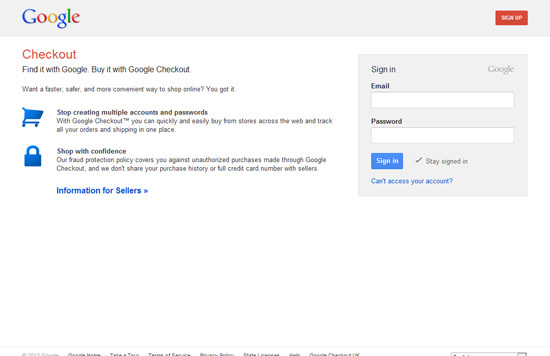 Google Checkout is Google’s answer to PayPal. Google Checkout allows users to pay for goods and services through an account connected to their Google profile. The major benefit that Google Checkout has over the competition is that millions of Internet users use Google for other services, making a purchase through Checkout a simpler process. 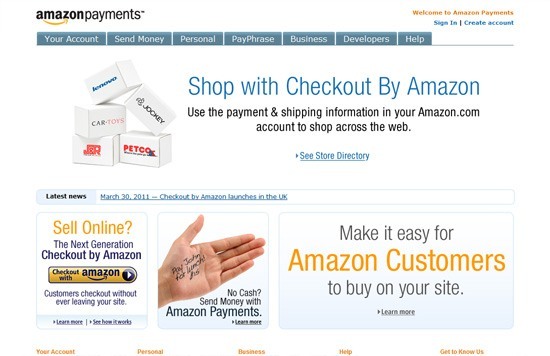 Amazon Payments allows its users to receive money using its API (and to send money out via ACH). Popular crowdfunding site Kickstarter uses Amazon Payments. 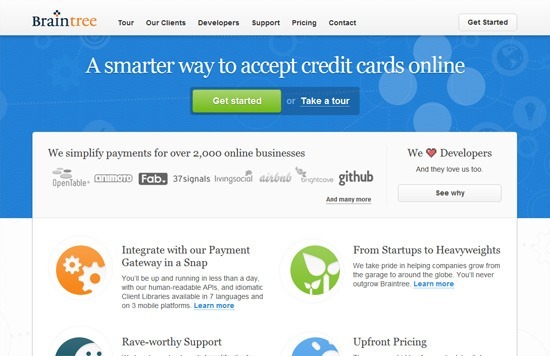 Dwolla is a direct competitor to PayPal. One of the newcomers in the third-party payments space, the company is processing over $1 million per day. 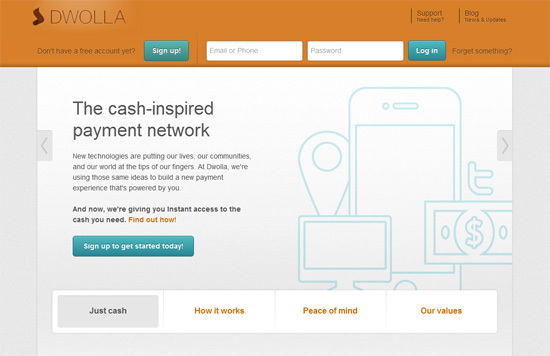 Setting up Dwolla payments is similar to PayPal, although Dwolla doesn’t have the same name recognition as their competition. 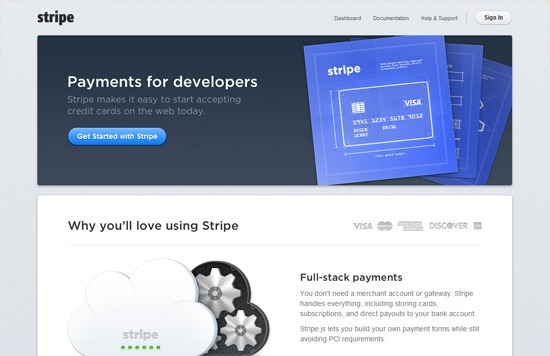 Stripe provides an excellent payment solution for web developers who would like to integrate a payment system into their projects using Stripe’s robust API. By bypassing the traditional sign up process, Stripe acts as a merchant account for its providers, handling all PCI compliance and merchant approvals. Braintree is an online payment gateway and merchant account solution known for working with popular tech startups such as Airbnb and LivingSocial. 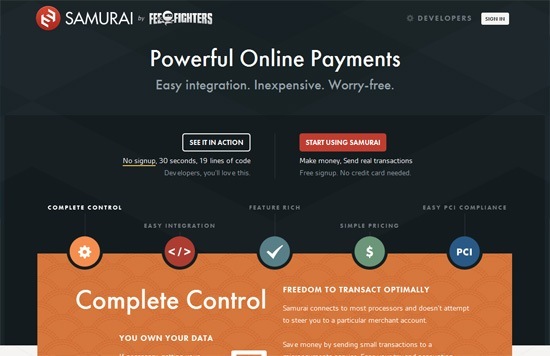 Samurai is a payment gateway and merchant account solution. The company’s main product, FeeFighters, is a tool to help merchants compare rates for merchant accounts. Samurai was developed as a direct competitor to Braintree and other gateway/merchant solutions and offers customers a payment gateway or a gateway/merchant account package. 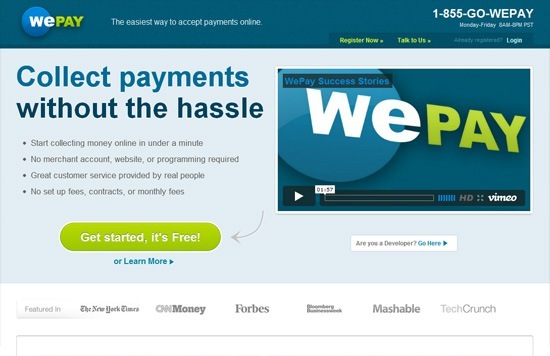 WePay is a payment processor that allows Internet merchants to accept credit cards and bank account payments online. WePay seems to be focused on the individual user, and has recently added e-store pages to their service to help their customers conveniently take in payments (e.g. event tickets, products, donations and so forth) through their service. 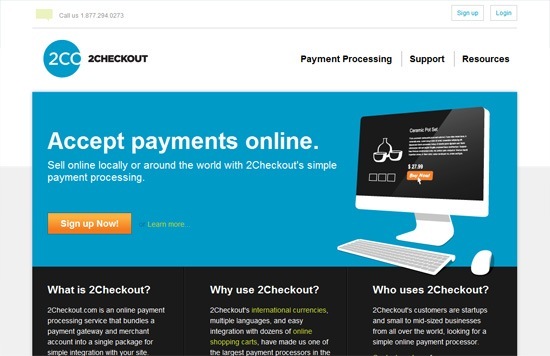 2Checkout is another payment processor that combines a merchant account and payment gateway into one, allowing customers to receive credit card payments as well as PayPal payments. The company offers international payments, shopping cart stores as well as a recurring billing feature. What about Payments through Mobile Devices? These two payment services allow merchants to accept credit card payments directly through their mobile devices, making it possible for devices such as the iPhone, the iPad and Android smartphones to act as a mobile point of sale (POS) checkout system. There are plenty of online payment systems out there that you can use to conduct e-commerce activities. Choose one that’s in line with your business objectives. If you work with an e-commerce marketing agency, such as WebFX, ask your account manager what they suggest based on their experiences. WebFX works with a variety of industries, from hotels to boat dealers, so they likely have experience working with similar e-commerce businesses to yours. This isn’t an exhaustive list of online payment systems. If your favorite online payment system isn’t on the list, please share it with us in the comments and discuss why you choose it over other online payment systems. Ah, font pairings — to a designer, the two-word phrase is exciting, but to an average Joe, probably not so much. What’s so important about font pairings anyway? Can’t you just pick two fonts for your website and call it a day? Well, you could, but it may not be in your best interest. Choosing fonts that go well together help your page to flow nicely, have an aesthetically-pleasing look, and ensure that your website or graphic looks professional and readable. However, simply choosing any two fonts on a whim, or just because you like them each separately, doesn’t mean they work well together — and if they don’t work well together, your design may suffer. In this blog, we’ll take a look at some of the best font pairings that work together to create a great design for your website, social media graphics, presentations, and more. The design a company chooses impacts how a potential consumer perceives them. From color choice to style, different elements add up to create a first impression. This means that bad design – or lack of design – can have potential customers closing the browser and seeking other businesses. As a result, your company’s design can affect several components of your digital marketing strategy, and this is especially true of content marketing. Do you want users to spend time on your site and stick around long enough to convert? If so, it’s essential that your content is easy to navigate. If finding information is difficult, users will likely become frustrated and leave, in search of a site that provides a better user experience. A website that is easy to navigate will lead to longer visits and increased conversions. And given that your website’s ultimate goal is to generate sales and leads for your business, this is essential. There are a few different ways to setup your site’s navigation, and two of the most popular are top and side. The one that’s best for your site depends on your content, so in this post, we’ll take a look at a few different navigation options and why they may or may not work for your business.